Edmontonians are so lucky to live where we do for a lot of reasons, but especially because January through March, Edmonton is the only city in Canada to feature an Ice Castle! It’s become a huge attraction for locals and tourists alike. I know I look forward to visiting the Edmonton Ice Castle every year—primarily to take some awesome winter photos! The Ice Castle is so Instagrammable. The Edmonton Ice Castle, located in Hawrelak Park, is made up of 25 million pounds of ice. The jaw-dropping structure features stunning ice walls, archways, fountains, slides and more. Each tower in the castle is 10-20 feet thick. 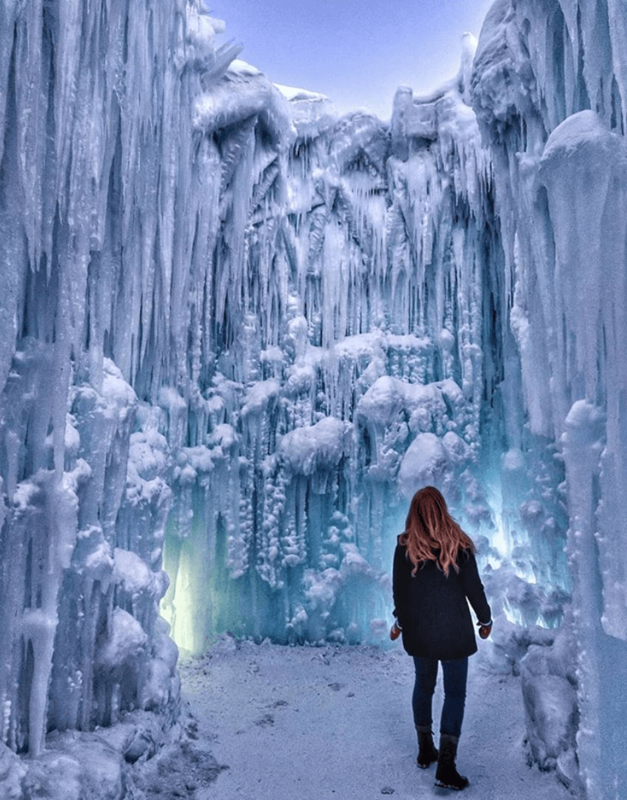 This year’s Ice Castle includes even more icicle arches, mazes and pathways—making it a little easier to get that perfect photo without someone in your shot. I always know when its Ice Castle season because my feed blows up with the most magical winter photos. There are always some great spots you’ve got to photograph, and lovely poses you’ve got to take during your visit. Below are some photos I suggest you take during your visit to the Edmonton Ice Castle. Use this as inspiration, but try to make the photo your own too! I always love seeing the slightly different angles, slightly different poses, and creativity some visitors share on social media. Can’t wait to see what you come up with! 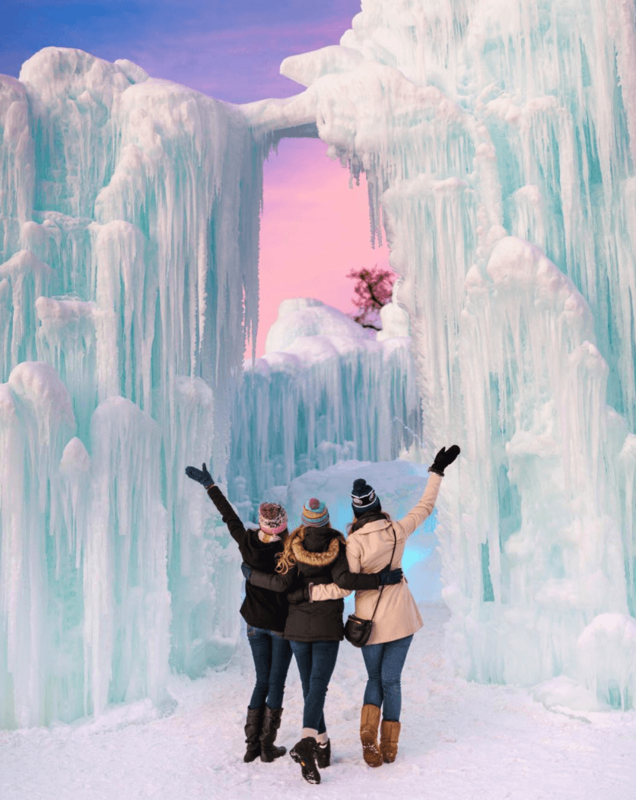 Be sure to tag the Ice Castle YEG location tag and #IceCastles hashtag! 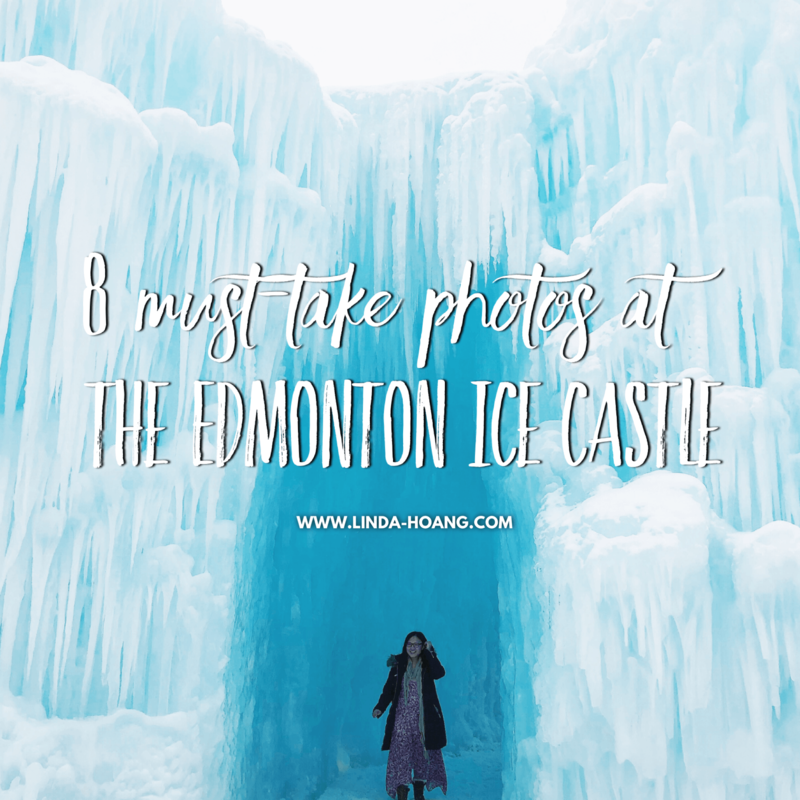 Pin + share my blog post: 8 Must-Take Photos at the Edmonton Ice Castle! 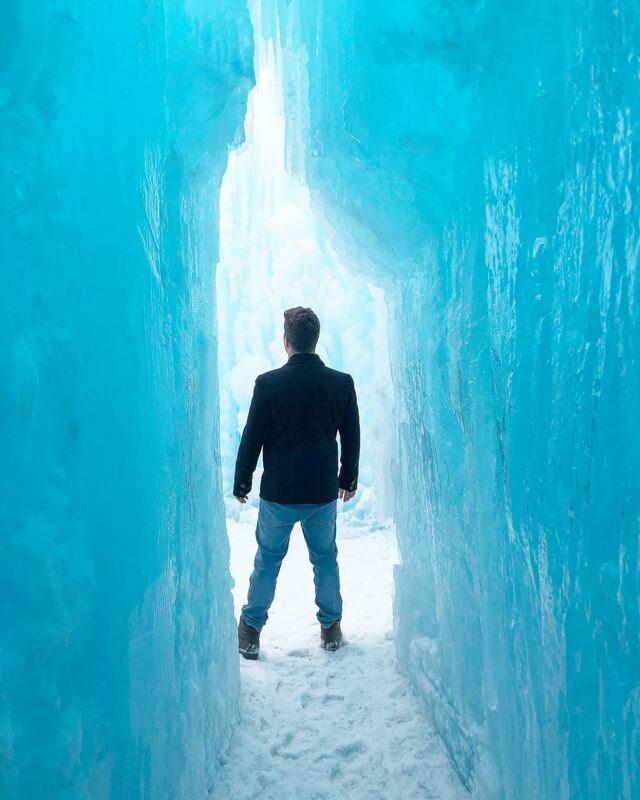 Under an icicle arch, through an ice opening, is a must-take photo at the Ice Castle! The Ice Throne is always a great photo spot. This photo is from 2018 (when we went opening weekend 2019 the ice throne wasn’t *quite* ready but should be good to go now by time of posting this blog). But the Ice Throne is one of the few photo spots in the Ice Castle where you’ll see a line-up forming. This is a great photo to use the phrase Ice Queen or King and feel like royalty, haha! 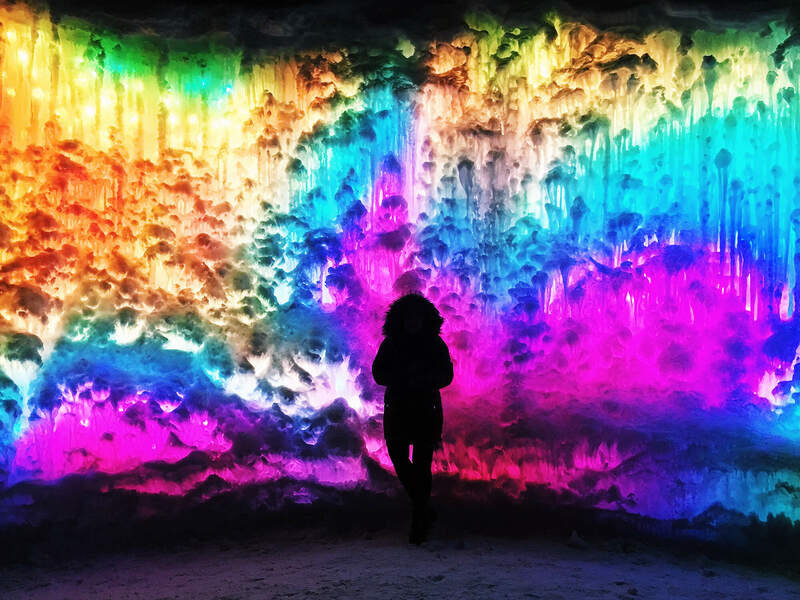 If you post a photo at the ice wall, please also use the hasthag #IGWallsofYEG (Instagrammable Walls of Edmonton!) because these icy walls are definitely Instagrammable Walls! The slide may not be the most Instagrammable or easiest to make Instagrammable because there may be other people sliding down or waiting to slide down in your shot, or there may be parents along the sidelines also trying to get a nice photo of their kid or family member, but if you can get the right angle it’s both a lot of fun and a really nice moment captured on camera. 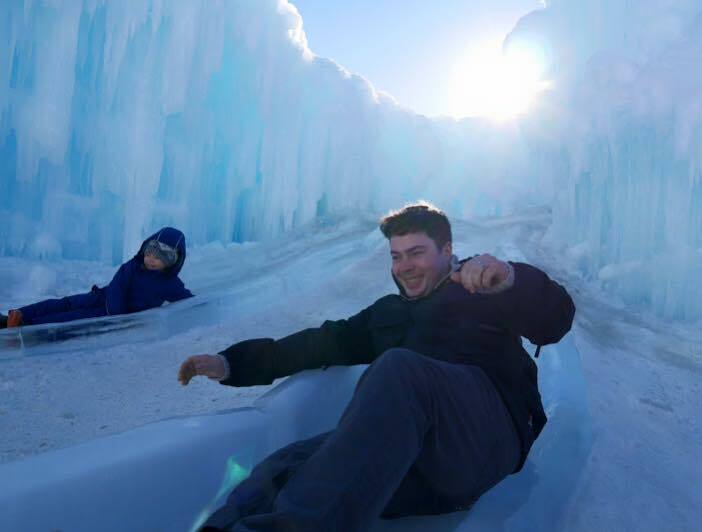 Also, Ttere are more ice slides than ever before at the 2019 Ice Castle. 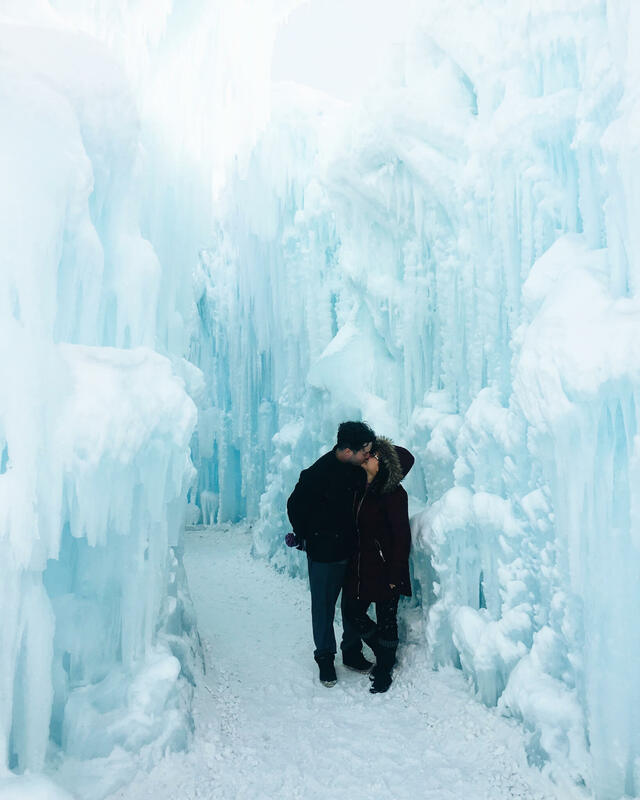 Kisses in the Ice Castle! Iconic picture. I’m totally in awe of all the wedding photos that happen at the Ice Castle. If you go with your partner, smooch it up. Photo Credit: @daniellerbevens (Instagram). Click the photo to view the original post on Instagram! But if done right (and safely), this photo does turn out really great. Photo Credit: @tomstoncel on Instagram. Click the photo to view the original post on Instagram! Link up your arms, turn around and do the cutest little friend group pose against the Ice Castle there ever was. Photo Credit: @fotosyth on Instagram. Click the photo to view the original post on Instagram! The “look up” in awe / wonder photo is a pretty common one at the Ice Castle. I’ve seen some really unique perspectives (close up of the person’s cute winter toque with the head looking up, far away person in the distance surrounded by the massive structure looking up, even looking down in wonder photos are nice too… give it a whirl at any location in the Ice Castle! MORE PHOTO ANGLE TIPS: Be sure to get a front-facing shot, back shot, and shots where you look up, look down, and look to both sides at each of your photo spots in the Ice Castle. I also really like when there’s lots of height in my Ice Castle shot. This really emphasizes how massive and unique the structure is, so try to find height. Another thing I love in Ice Castle shots are depth, so if you can show the many layers or add depth to your photo, that will make it look even more stunning! I shared some of these tips in my 2016 blog post about visiting the Ice Castle but they’re still true so I’m including them in this post too. Keep these tips in behind as you plan your visit! Pre-order tickets online! This is the most important tip. Tickets are cheaper if you buy online, and then you can also book a time so when you arrive at that time you can just walk right in (typically). Go to the Ice Castle at least twice – once during the day and once at night for different views, vibes, and experiences! Bundle up! It’s way more fun to walk through the Ice Castle if you’re not cold. Plan your outfits accordingly! Knowing you’re going to be taking lots of photos, you could consider your jacket as one outfit for a series of photos, and then whatever you’re wearing sans jacket another outfit. Also note for outfits: brighter colours really pop with the Ice Castle as its backdrop. Wear a pop of colour! Bring the family! 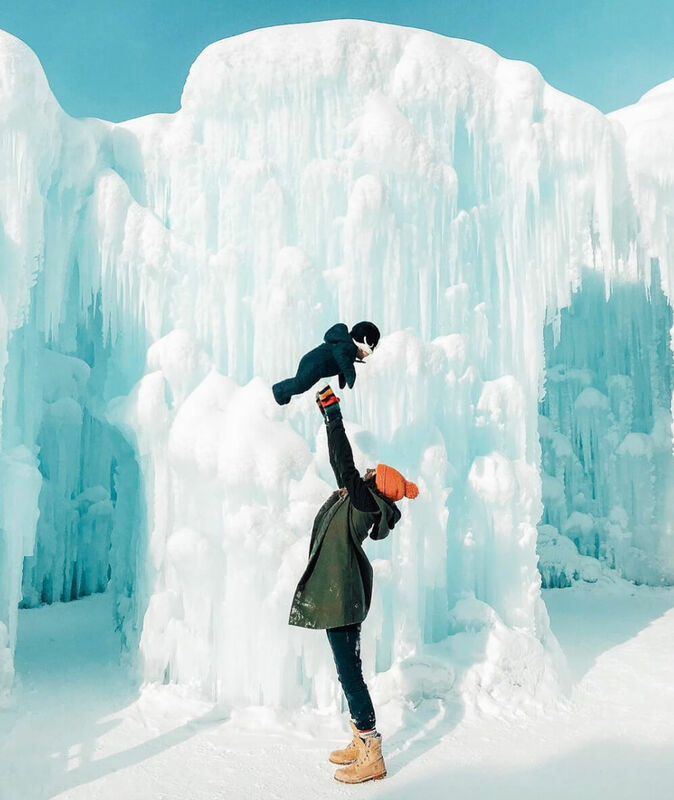 The Ice Castle is a great stop for all ages. Kids will be in wonder, but so will adults. However for photo op purposes, going with a partner or friends who understand what you want for Instagram is probably best (lol). Try to go weekdays (if possible) to avoid the crowds. This year on weekends, they also have princesses ready to pose with kids at the feature wall, so it sort of gets in the way of your photo there (unless you’re going with your kids—then the weekend is perfect lol). Plan your visit to coincide with the Silver Skate Festival, or go skating on the Hawrelak Park rink after! Finally, I wanted to share a few more tidbits about the Ice Castle! They have this information on site too—it’s great learning about the process behind this magnificent, Instagrammable ice castle! The ice appears blue like natural glaciers. Blue ice happens due to the high density of ice, along with a lack of air bubbles. Without the scattering effect of air bubbles, light penetrates ice more deeply. To the human eye, glacial ice acts like a filter, absorbing red and yellow light while reflecting blue light. This creates the blue hues of the Ice Castle! To build the Ice Castle, staff need to hand place icicles. They grow 10,000 icicles each day to harvest and place to create the Ice Castle. The structure is 100% ice. The water used to build the Ice Castle comes from the North Saskatchewan River, treated, clarified, filtered and disinfected by EPCOR! In spring, ice melts, is de-chlorinated and water drains right back into the river. The process is considered non-consumptive use. 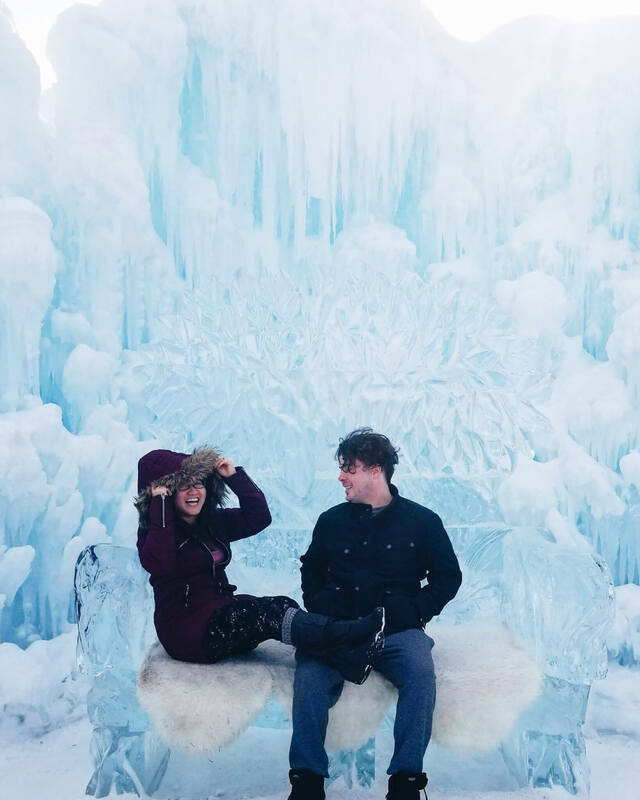 I hope you enjoy your visit to the Ice Castle, and I hope my photo inspo helps you frame up your photos! Disclaimer: My visits to the Ice Castle are complimentary as media to gather content for my blog and social media posts! This has no impact on opinions stated in this post. 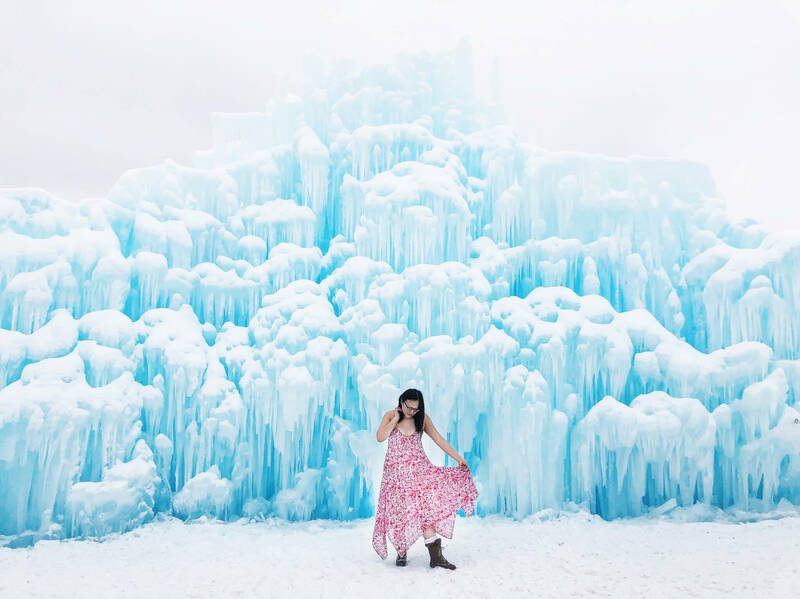 I’m obsessed with Instagrammable backdrops and the Ice Castle is certainly that.